When people talk about World War One, people think global, nations banding together and pitting against others. Closer to home we think of the ill fated Gallipoli campaign which brought Australia to the attention of the world. What often falls to the wayside of this are the individuals who participated in the efforts, who made up that legendary group that is the Anzacs. Like many Australian towns, Camden gave its share of enlistments. From high ranking leaders, to born and bred heroes who responded to the call to arms, Camden’s contribution was as diverse as its people. The highest ranking Camden man to serve was Major George Macarthur-Onslow. A descendant of John Macarthur, Macarthur-Onslow was a career soldier. He enlisted in the New South Wales Mounted Rifles in 1895, and was promoted to lieutenant the following year. During the war he was appointed second-in-command of the 7th Light Horse Regiment (LHR) under Lieutenant-Colonel J. M. Arnott. A game of cricket on Shell Green in 1915. Major George Macarthur-Onslow batting and being caught out. He saw service as a dismounted unit at Gallipoli between May and December. After a brief illness, he took command of the 7th LHR in October. After recovering from serious injury at Romani, he and his regiment were in operations in Gaza, Beersheba, and Jordan. He was given charge of various brigades, the most notable as a temporary brigadier general commanding the 5th Light Horse Brigade in September 1918, capturing Damascus. His time overseas ended in January, 1919 when he contracted typhoid and was invalided back to Australia. He was commemorated numerous times, including being awarded the Order of the Nile (3rd Class). 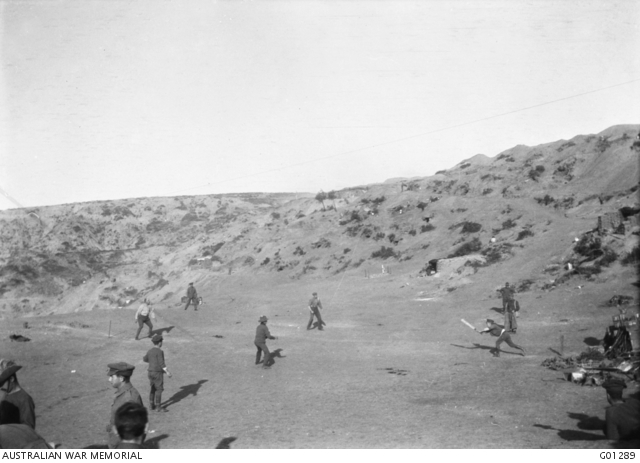 Perhaps the most memorable incident of his career during the war was on 17 December, 1915, with his participation in the Shell Green cricket match in an attempt to distract Turkish forces from the imminent departure of allied troops from Anzac Cove. Although a lively and spirited game, shells were passing overhead for the duration of the game. Reverend Thomas Giles Paul was born in Surrey, England and came to Australia in 1913 to study for the ministry. When the war broke out he paused his studies and enlisted, serving in Gallipoli and France. He rose to the rank of Captain, was nominated for DSO, an OBE, and awarded a Military Cross. Continuing his theological studies after the war, he moved to Camden in 1927. He would eventually become rector of St. John’s Anglican Church, Camden. Two years before settling in Camden, Rev. Paul became involved with Toc-H, a Christian movement that started as a soldier’s club in Poperinge, Belgium during the war. The organisation is a service based charity, where its members work either together or individually to alleviate burdens people experience. Rev. Paul brought it to Camden, and it would prove beneficial during the 1920s and 1930s, especially with the social and economic stresses created by the Depression. Cecil Herbert Clark, who joined the war effort at the age of 31 in 1916, was born at Cliff Farm on Old Razorback Road, Picton. Clark was unique among soldiers. He was significantly older than the average enlistee. He also performed some intelligence work during the war. But his most unique characteristic is the large number of letters he wrote to three members of his family. The letters reveal a great deal about the experiences of the men that went to war. The letters also give us a reminder of the large number of people who went to the war. Clark, in several letters, mentions other people from the area who he encountered. Some of those named include Pierce Doust, Fred Boardman, and Bob Sidman. What makes Clark unique in this article was sadly all too common for the men that joined the war effort. Whereas Macarthur-Onslow would return to Camden and serve as an alderman and four times as Mayor, and Rev. Paul would become the sixth rector of St. John’s Anglican Church, Clark, like so many during the 4 year conflict, would not return home. He was killed on 15 August, 1918, when a shell hit the dugout he was stationed in, causing the timber to fall on him and the other occupants. A full list of those from the Macarthur region who would not see the end of the war can be found at Camden Remembers. These were three different men, with different lives. But they share two bonds: their love of the town of Camden, and their conviction to join the Anzacs to protect it. Bou, Jean. (2010). Brigadier-General George Macarthur-Onslow. Australia’s Palestine Campaign. Australian Army Campaign Series. Army History Unit, Canberra. Clark, Cecil Herbert. (2009). Letter’s from the Western Front, 1916-1918. Camden NSW, Camden Historical Society. Johnson, Janice. (26.04.10). A solider’s letters home. Back Then. The District Reporter. Johnson, Janice. (20.04.09). Toc H- Caring for People. Back Then. The District Reporter. Walsh, G.P. 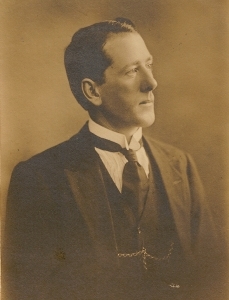 (n.d.) Macarthur-Onslow, George Macleay (1875-1931). Australian Dictionary of Biography.